Florida is known for sunshine, oranges and miles of pure white sand beaches beckoning travelers from around the world. From the east coast to the west coast, and the panhandle to the Keys, the turquoise waters of the Gulf of Mexico and the deep blue waters of the Atlantic promise endless hours of fun, exploration and discovery. Many of Florida’s beaches continually make the “best of” lists and this year is no different with an impressive list making the Dr. Beach Top 10 Beaches, The Travel Channel’s Top Beach List and TripAdvisor’s Top 25 Beaches based on actual user reviews. Here’s a small sampling of the winning shorelines. 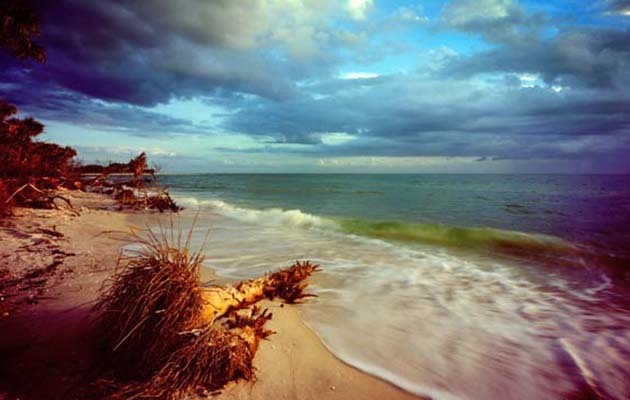 Coming in at #2 on the 2014 Dr. Beach Top 10 Beaches is Barefoot Beach Preserve County Park. Located in the southwest portion of the state in Bonita Springs, the beach is another example of why Florida beaches continue to make the list. The sugar white sand that crunches beneath your feet is filled with interesting shells for collecting. The 342-acre beach park is one of the last barrier islands that remain undeveloped. Enjoy the best of both worlds with the park’s natural surroundings providing warm waters for swimming and fishing, and the inland area with mangroves and creeks. The park is home to a variety of tropical trees and nesting areas for turtles including the gopher tortoise and Loggerhead sea turtle. Park Rangers offer guided tours discussing the many facets of the habitat and wildlife in the preserve. Restroom and shower facilities are available along with concession stands, picnic area, and 356 parking spaces. Naples is less than 30 minutes away where you’ll find the sandy shores of Delnor-Wiggins Pass State Park, #10 on the Dr. Beach top beach list.